Less than a third of Australian adults get the recommended daily intake of fibre. A lack of fibre in the diet often leads to stomach pains, bloating and sluggishness. If you feel your digestion is sluggish, you are probably finding it difficult to operate at 100%. By having the right amount of dietary fibre every day, you can feel better and your digestive system will function the way it's intended to. Unlike some fibre products, Benefiber is invisible, tasteless and dissolves completely, which means you can add it to just about anything. You won't even know it's there! With multi-benefits, it's easy to add Benefiber to your daily routine! 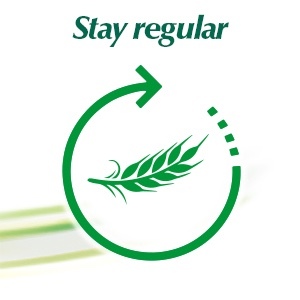 Taking Benefiber every day is a simple way to increase your daily fibre intake. Sprinkle it in your water, coffee or juice. Add it to your yoghurt or pop it into your cooking. Benefiber won't alter the taste or texture of your foods or beverages (hot or cold). Having a sufficient amount of fibre in your diet will help manage regularity in a natural way, so you can get on with your day. 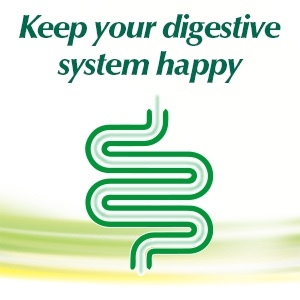 When the digestive system isn't working perfectly, you can experience symptoms such as bloating and tummy discomfort. Fibre is important for the functioning of the digestive system and helps maintain digestive health. Can I get all my daily fibre needs from Benefiber? Benefiber should be used only to boost your fibre intake, not replace a balanced diet. It is important to note, fibre intake should be increased slowly over a period of time. A sudden, large intake of fibre can cause gas and abdominal pain. Dietary fibre is the part of a plant which is not digested. It is found in cereals, fruits and vegetables. The main role of fibre is to keep the digestive system healthy. Fibre is important in maintaining digestive health. Diets high in fibre improve the health of the digestive system by adding bulk and attracting water. This allows the faeces to pass easily. Will Benefiber have an immediate effect on regularity? Adding fibre to your diet does not have an immediate laxative effect. It may take several days to feel the benefits and maximum effect is seen with everyday use. Do you need to drink more water when you take Benefiber? Because fibre absorbs water, you should increase your water intake. It is always a good idea to drink plenty of fluids, but no need to drink an excessive amount. 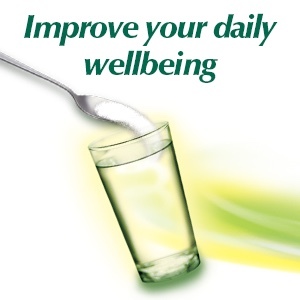 Start by trying to drink an extra glass of water a day. Not getting enough fibre in your daily diet? Benefiber is a 100% natural daily fibre boost. It’s clear, taste-free and dissolves into almost anything. Unlike some fibre supplements, Benefiber is invisible, tasteless and dissolves completely, which means you can add it to just about anything. Benefiber can deliver up to 20-25% of your recommended daily fibre intake. Simply sprinkle it in your water, coffee or juice. Add it to your yoghurt or pop it into your cooking to include fibre in your diet. Benefiber won't alter the taste or texture of your foods or beverages. You won't even know it's there! Now it's easier than ever to add fibre to your diet with Benefiber, made from 100% natural ingredients that you can mix with almost anything. Benefiber makes taking fibre easier. It dissolves completely in most beverages and soft foods. Taste-free, no added sugar and made from wheat. Be creative with Benefiber. Try it in your coffee, juice, yoghurt, your baked goods, favourite recipes or whatever you desire to add fibre to your diet. It's even great for cooking! - Dissolves completely in most beverages and soft foods. - 100% derived from wheat. No added sugarMade from wheatNutritional Information:Servings per package: 142Serving: 3.5 g (2 teaspoons)Energy: Average Quantity Per Serving: 32 kJ (8 Cal), Average Quantity Per 100 g: 913 kJ (218 Cal)Protein: Average Quantity Per Serving: Less than 1 g, Average Quantity Per 100 g: Less than 1 gFat total: Average Quantity per serving: Less than 1 g, Average Quantity per 100 g: Less than 1 gSaturated: Average Quantity Per Serving: Less than 1 g, Average Quantity Per 100 g: Less than 1 gCarbohydrate: Average Quantity Per Serving: 0.5 g, Average Quantity Per 100 g: 14.2 gSugars: Average Quantity Per Serving: Less than 1 g, Average Quantity Per 100 g: Less than 1 gDietary Fibre, total: Average Quantity Per Serving: 3 g, Average Quantity Per 100 g: 83 gSoluble: Average Quantity Per Serving: 3 g, Average Quantity Per 100 g: 83 gSodium: Average Quantity Per Serving: Less than 5 mg, Average Quantity Per 100 g: Less than 5 mgUse within 6 months from opening. 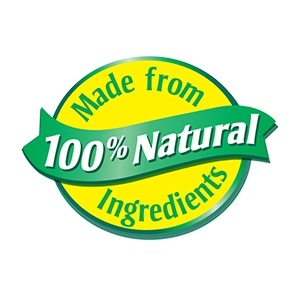 Stir 2 teaspoons of Benefiber powder into at least 1/2 cup of any beverage or soft food (hot or cold). Stir well until dissolved. Not recommended for carbonated beverages. Storage Temperature: Store at controlled room temperatures 20-25°C. Benefiber Natural Fibre Supplement 74 Serves 261g is rated 4.5 out of 5 by 8. Rated 5 out of 5 by Karm Down from Great Product Dissolves completely with no lumps and no taste. Comes in convenient bulk sizes and sachets perfect for travelling. Rated 5 out of 5 by Lioness from Excellent product Great way to get added fibre in your diet. Can be used on or in anything. Tasteless.